NEW YORK (AP) — Andy Roddick is trying to get his shoulder ready, hoping he can still bring the high heat on serve. The former U.S. Open champion will be back in town and wants to have his game with him. "Coming back to New York is certainly not a place where I want to not play well," Roddick said. He will play fellow tennis Hall of Famer Jim Courier on Feb. 9 in an exhibition match to kick off the New York Open, event organizers announced Wednesday. Wimbledon finalist and defending champion Kevin Anderson and top American John Isner headline the field in February for the second year of the ATP Tour event, which Roddick won three times when it was based in Memphis, Tennessee. 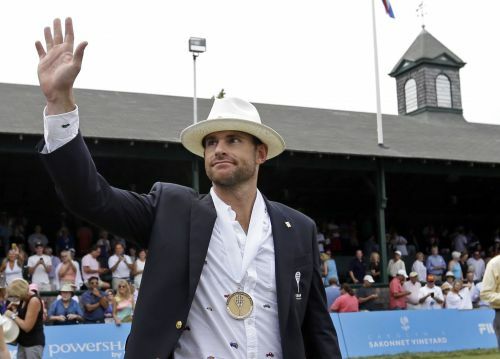 It has since moved to the Nassau Veterans Memorial Coliseum in Uniondale and Roddick says it remains a valuable tournament for players who want to prepare in the U.S. for the big events that soon follow in Indian Wells, California, and Miami. He found that worked for him and it certainly did last year for Anderson, who used his victory on Long Island as the springboard for his first career finish inside the top 10 at No. 6. Isner, whom he beat in a marathon Wimbledon semifinal, finished 10th. "You want to kind of find form early in the year. You can train as hard as you want, you can work as hard as you want, you can't put confidence in a bottle," Roddick said. "Sometimes I'd play well in Australia and then I'd feel good in Memphis. It kind of does give you a little bit of rhythm to your year and especially a guy like me or Kevin, who might not like the clay as much as some of the other guys, those first three months through March are super important." Americans Jack Sock and Sam Querrey, last year's runner-up, will also be in the field of the Feb. 9-17 event along with Alex de Minaur, the ATP Newcomer of the Year who will turn 20 the day of the final and is also playing doubles with fellow Australian Lleyton Hewitt. Mike and Bob Bryan headline the doubles field after Mike teamed with Sock to win Wimbledon and the U.S. Open last year while his twin brother was recovering from a hip injury. Roddick rode his fierce serve — he had one timed at 155 mph in a 2004 Davis Cup match — to the 2003 U.S. Open title, the world's No. 1 ranking and nine straight finishes in the top 10. Only 30 when he retired in 2012, he said he could still play with guys on tour until a couple years ago but estimated he played fewer than 10 times this year. But the opportunity to come back to New York, where he and Courier will also co-host a "Taste of New York Open" on opening night, renewed his enthusiasm to play. "Tennis has been a part of my life since I was 6 years old so you don't want to just completely throw it away," Roddick said. "So I was pumped, I was excited."